Do You Have A Bankruptcy Prejudice? Of Course. How Long Does Foreclosure Take? How Do I Stop Foreclosure? How can Merna Law help? Set Your Own Appointment Now! Request Your Free Infographic Of The Bankruptcy Process Today!!! Review Us. We Love It! Introduction To Bankruptcy Credit Recovery! 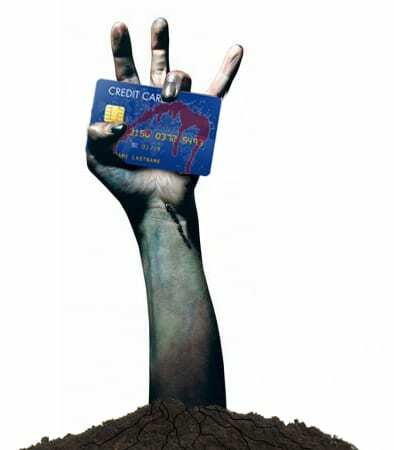 Are You A Credit Zombie? by Merna Law | Virginia Bankruptcy Blog: Some information may be considered "LEGAL ADVERTISEMENT". Don’t Believe That Brain Eating Zombies Only Come Out On Halloween. “Can I get more credit?” … No. “Can I afford more credit?” … No. “Can I afford my current credit?” … No, not usually if you are talking to a bankruptcy attorney. “Can I get lower interest rates with my current credit?” Mmmmm. Nope. Ask yourself these questions. If your answer is “No” to any of these questions than you are a “Credit Zombie“. Yes, a Credit Zombie. You are among the living dead, credit-wise anyway. Your credit life has been extinguished. You only have the illusion of credit life. And like a zombie you are not aware you are dead. You have a quenchless thirst for “good” credit, but like in zombie movies you can eat all the brains and flesh you want…it won’t bring you or your credit back to life. The worst of it all is that society (read “the banks and credit”) and card companies want you to stay in your zombie coma and keep paying and paying as the last drop of life and cash are sucked out of you like your soul. Zombies can be fun to watch on TV. I guarantee you it is not fun to be a credit zombie. Think about it. TIRED OF BEING A CREDIT ZOMBIE. LET MERNA LAW BRING YOU BACK TO LIFE. CLICK HERE FOR A FREE CONSULTATION. REQUIRED BAR NOTICE: THESE TESTIMONIALS DO NOT GUARANTEE SIMILAR RESULTS. The Merna Law Group, Attorneys At Law, P.C. …kind and friendly from the start!5 Stars! “Everyone there was kind and friendly from the start and helped us with everything in a timely manner. They were never rude no matter how much we called or asked questions.” Reviewed by B.P. of Virginia Beach on Feb 20 . The Merna Law Group, Attorneys At Law, P.C. Didn’t have to worry about anything!5 Stars! “Just keep providing the type of service you do. You business values are based off reliability and service. Today’s Law Offices just don’t offer that kind of experience. Didn’t have to worry about anything!!! Just being able to go on with my normal life and know that all my issues are well taken care of is a relief in itself.” Reviewed by A.P. of Virginia Beach on Mar 4 . The Merna Law Group, Attorneys At Law, P.C. …overall experience was outstanding!5 Stars! “My husband and I were very happy with The Merna Law Firm. They are well organized, time manageable, and friendly. I was even able to bring my children with me if I needed to. In court, they stayed right there beside us and answered all questions we had. Our overall experience was outstanding and I am glad we were represented by the Merna Law Group.” Reviewed by A.M. of Suffolk on Mar 5 . The Merna Law Group, Attorneys At Law, P.C. …debt free!5 Stars! “A friendly staff and outstanding attorney who helped me through a difficult time in my life. Thanks to everyone at the Merna Law Group who helped me move on to and new chapter in my life debt free!” Reviewed by M.F. of Norfolk on Mar 8 . The Merna Law Group, Attorneys At Law, P.C. …very helpful and friendly!5 Stars! “Everyone at the office was very helpful and friendly. The attorney answered all of our questions and helped us through the entire process. He was also very helpful answering concerns that we had after the process was completed/over. Highly recommended!” Reviewed by M.E. of Virginia Beach on Mar 11 . Baby Boomers & Bankruptcy: Make Your Retirement Better. February Is “Fresh Start” Month. © 2018 The Merna Law Group. All Rights Reserved. The Merna Law Group, P.C. is a debt-relief agency under federal law. We assist families and individual with filing bankruptcy to halt debt collections, lawsuits, foreclosures, repossessions, and garnishments in order to gain a fresh financial start.